“I simply do not want to dance the last dance on Titanic!” said a young participant at the GEN conference in Estonia, which ended in mid-July. This was her answer to the question: ‘What gives you hope and the will to work in the extremely precarious times we live in?’ Another participant said she was pessimistic about the future, but she was still choosing to live in accordance with her values. A young man added that he simply wants to be part of the change that is emerging. Older members thought that living in an intense community is a 24-hour workshop, which no money can buy. Living together leads to close contact and inner empowerment. Working with groups brings intergenerational openness – the elderly embody maturity, while youth usually embodies the new. The place where old and new interweave, where tradition and innovation meet is extremely attractive, so it is no wonder that more and more people yearn for such places. Millions of people around the world do not agree with the fundamental design of global society and its current direction. They want something different, but they cannot get it from the guardians of the existing social system. In search for alternatives, they are often left to themselves and their own ingenuity. They begin to create something different on their own. It takes some time for such pioneers to meet and recognise each other as messengers of the emerging future – of one of the possible futures, actually. At the GEN conference there is an increasing need to connect pioneers from the 1970’s and 1980’s, with the youngest seekers born at the turn of the millennium. Young people are disappointed with the legacy of older generations, but at the same time happy that amidst the global race towards more and more and more, there are at least some people already happily living with less for decades. Yes, there is hope! Even if we put together all sustainable and regenerative initiatives in the world, their force would be minute in the face of the mighty power of neoliberal capitalism. Albert Bates reminded us of the research from the 70’s, when scientists already understood the limits to growth and where untamed, ceaseless growth would take us. He recalled the beginnings of a neoliberal idea when (only 50 years ago) it was seen as crazy and unrealistic. Today it is our reality. Many people nowadays think that a green future is unrealistic, but we shouldn’t rule it out; maybe in 50 years today’s youth will be facing their own limitations and looking for the next level of alternatives. The enlightened should not allow centuries of science to drift away just like that. Gunter Pauli asked us to be critical of our own knowledge. He stressed that all university diplomas come with an expiry date; diplomas are only a ticket into the world, they are not knowledge in and of themselves. Gunter stressed that the current educational system is stuck and full of self-denial. As Jonathan Dawson put it: Economic textbooks still do not cover the economic crisis of 2008 because it should not have happened. Teachers need to learn from their students, thus they can become masters, as they call great teachers in the East; and masters need to learn from teachers to become great masters. Great masters will have an exceptional privilege: they will have masters as their students. These were the words of the author of Blue Economy. He said that economic approaches and techniques, which are generally the crux of the modern economy, are less important than principles and values ​​of coexistence and inspiration, which is the basis of knowledge transfer in society. With these principles, coupled with the wisdom of community, we can achieve miracles. In the new IPCC (Intergovernmental Panel on Climate Change), they study ecovillages because they want to understand how much people are willing to change. Their question includes a premise that change is difficult. However, eco-communities are proving changes are possible, they are relatively simple, and they come with improved quality of life, which is the key feedback loop (the reward) that inspires even deeper changes. What is in our way? What are the main barriers? Particularly when we are forming community – while paying attention to nature and recovering ancient knowledge. The challenge for architects and spatial planners is to open up spaces where people can meet (even unintentionally) as they used to even some decades ago – directly, physically, not just in e-reality. A lot of funding is available for research and development in these areas, but ecovillage communities are only beginning to organize themselves well enough and set up strategic partnerships with existing institutions to start drawing on the available resources. Trillions of euros are available for green development. Opportunities are currently emerging particularly for development of local communities, intergenerational cooperation, working with refugees, and people’s science. Albert Bates, one of the world’s foremost experts and advocates of biochar, of course, had to speak about this amazing substance for enhancement of the soil. He said there are more than ten thousand articles published about biochar every year. It can be used as a substitute for sand in cement, as well as in cleaning and composting systems, it can be mixed with food for cows, etc. Albert concluded by saying that when we pull the carbon out of the atmosphere and fix it into the soil, we prove that we are respectful children of the Earth, not her rapists. Kosha Joubert highlighted the importance of the transition of traditional villages to ecovillages, which is moving strongly in Africa. It is not a law of nature that people move to cities. They are forced to do it by agro-industry and mining. Vibrant indigenous communities are the centre of environmental protection, because they love their home and protect it. Transition to empowered regenerative communities is therefore urgent. Only thus can we ensure the future of local communities and their ongoing connection with nature. Everything that is going on in the world is based on various assumptions. In the past basic assumptions (or dogmas) were in the domain of religion. Today prevailing global assumptions are in the domain of neoliberalism. These assumptions are the basis for government policies, and these policies have concrete consequences. Basic assumptions of neoliberalism are: globalisation is inevitable, the tide of the free market raises all ships equally, more consumption means more happiness, competition increases efficiency, capital controls and government regulations hinder growth, low taxes stimulate investments and new jobs etc. These assumptions shape the global worldview. Children accept the culture as self-evident, and already by the age of six, they are completely rooted in it. All this is now inherent in globalisation. It is stupid to deny globalisation, but we have to understand what it really means. We could call positive aspects of globalisation internationalisation (spaces of social exchange, cultural diversity, access to information, the Internet, etc.). Negative aspects are mostly in the domain of the economic system, since the rich mostly enjoy positive effects, while the poor get the negative. This direction is very difficult to change, since the rights of corporations dominate over workers’ rights, and European laws protect this. The trend in neoliberalism is privatisation, giving profits to a handful while increasing expenses for the consumer and decreasing quality of services, investments and maintenance. Today it is almost blasphemous to speak about taxing pollution; this is supposed to be bad for economic growth. On the other hand, it would stimulate growth elsewhere, in organic agriculture, for example. Protectionism of one single perspective of economic growth is extremely biased. The consequences of the above-mentioned assumptions of neoliberalism and the resulting policies are drastic: extinction of species, climate disaster, extreme inequality, masses of people in stress and diminishing health, the identity of politicians as ‘useful idiots’. No matter how much evidence we have for the inadequacy of the dominant story, we cannot change this story solely by facts. The de facto attractive neoliberalist story has convinced the masses for a reason, then it turned into a belief, and a belief system is immune to facts. Facts will always lose to a good story. Therefore a newer, better story is necessary. Ross Jackson named it heritage story. This story is based on the following assumptions: people trust one another, community living and sharing result in satisfaction, it is good to strive for reduced inequality, it is wonderful to live with less, people need meaningful work, etc. These assumptions are consistent with government policies that protect heritage, environment, culture and community, and promote localization, decentralization, ecological economy (no-waste circular economy), sovereign control of goods and capital flow, etc. This would stabilise climate, reduce inequality, redirect focus from quantity of life to quality of life and stop unnecessary transport of goods, etc. In order for all this to happen, Ross concluded, we should listen to the real needs of people, rather than listening to big corporations. Ecovillages have long been involved in close dialogue with the mainstream and they bring fresh innovations. Climate change is too obvious to be denied any more; therefore, the EU offers more and more resources for sustainable and regenerative projects, which suit ecovillages perfectly. BLOOM or Boosting European Citizens Knowledge and Awareness of Bio-Economy Research and Innovation runs under the Horizon 2020 programme, and GEN provides communication and dissemination. The aim is to explore bio-economy and everything we can do with natural resources, instead of using oil. Ecovillages also contribute concepts of sustainable lifestyle, natural construction, regenerative farming, degrowth, microproduction of biogas, biochar, composting, etc. 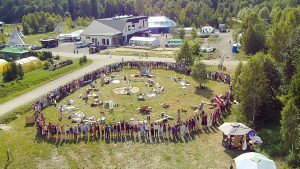 CLIPS 2 (Sustainable Communities Incubation Training Program) is an ERASMUS + partnership of 10 European national ecovillage networks, including the Slovenian association Sunny Hill. From 2015 to 2017, Sunny Hill was involved in the first part of CLIPS. The project was well assessed so we decided to continue with the second part. This gives us an opportunity for more quality meetings and supporting the emergence of sustainable communities across Europe. At the GEN conference we didn’t only hear about such larger, international projects, we also learned about a number of smaller projects. In Hallingelille, Denmark, the New Roots project supports work with refugees. The municipality does not know how to deal with refugees and has no quality providers to take care of them. Refugees need a sense of belonging and that is what they get in ecovillages. Inhabitants share with them their food, environment, friendship, work and purpose. Refugees complete the programme with a smile on their faces and more clarity on how to move on. An interesting development in Italy is the preparation of a law whereby ecovillages and intentional communities would have special legal status, by which exchanges between members could take place in the same way as within the family. In Pamplona, ​​Spain, a meeting was held in June on rural development and ecovillages. The regional government in Navarra has 60 abandoned villages and estates, and is therefore thinking of turning them into ecovillages as role models of sustainable development in rural areas. Members of the Iberian Ecovillage Network (RIE) would like to expand this model to other regions where there is less understanding for such revival of abandoned villages. These are just a few of hundreds of current projects. We will celebrate the results and achievements of sustainable local initiatives on the 22nd of September 2018 on the European Day of Sustainable Communities. We invite all groups that work towards sustainable development and regeneration to organize an event on this day and register it on the website: www.sustainable-communities.net. It can be an open day, a round table, a lecture, a celebration, harvesting and food processing, renovation, construction, etc. We would love to ensure visibility of the diversity of local initiatives everywhere in Europe. There is hardly any problem in groups more burning than the problem of disagreement. The conflicts that follow have destroyed millions of initiatives. Where to start tackling this question? Jonathan Dawson, professor at Schumacher College, started with education. He highlighted three limiting assumptions in the current educational system, which produces bored children with hardly any imagination. Such children, of course, are incapable of deep relationships and community building. The limiting assumptions are: there is a fixed body of knowledge to be transmitted from the expert teacher to the students; the intellect is the only scientifically valid mode of inquiry and learning (emotions are subjective and unreliable, let alone the body); and learning is primarily an individual pursuit (collaboration is called cheating). This completely denies the perspective that knowledge is not fixed but keeps emerging as a social construct. Learning for the future demands transdisciplinary, emotionally intelligent people. We need a radical change in the system so that people would even be able to ask themselves ‘what are our ways?’. Schumacher College teaches young people how to access key elements affecting the geological substructure of the system. They are bringing life back to the classroom and encouraging students to get fully involved in transition and to embrace all hard questions. It is useless to look at experts for answers (and questions), because they do not really know what they are doing. So how to coexist with other people? How to develop social skills, communicate, and work together? How to maintain healthy relationships? How to keep up the inner fire of righteousness? How to be ethical as a leader? How to stay hopeful in the world that seems to be rushing towards destruction? I am at peace with uncertainties of the world I live in, realising that the right questions, not the right answers, are the seeds of the new story. This gives me trust that all our efforts to regenerate communities and nature are not the last dance on the Titanic.